This dual pickup version of the model 4000, the legendary 4001S, is the forerunner of the model 4001 we know today. The 4001S offers all the features of the model 4000 bass, plus a second pickup to provide even more tonal range. The body, neck and headstock is made of maple. Rosewood fingerboard with dot markers. 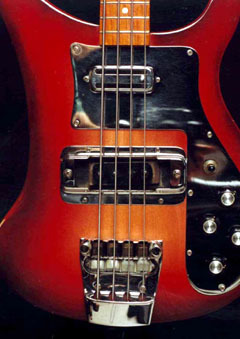 The bass on the photos, with a chrome pickguard, is made in August 1976. * The most recent information I have received says that this may be a modified Model 4000. The jackplate is from a 1964 Model 1996.